The first fully automatic Nerf Clip System blaster so far, the N-Strike Stampede ECS blaster features a pop-out bipod, which doubles as a handle, and a removable shield allowing players to transition to an attack posture with protection. 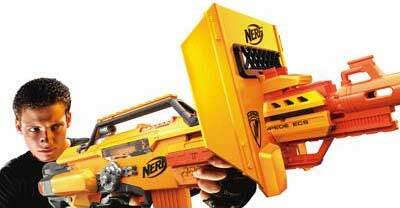 The stampede blaster also comes with one six dart clip and three extended clips which each hold eighteen darts, offering the highest clip capacity from Nerf so far. The N-Strike ECS blaster is one of the most advanced developments released. Includes sixty clip system foam darts.